Molly Ivins died two years ago today. Her writing combined outrage over injustice with biting humor. President Barack Obama issued a series of executive orders Friday that he said should "level the playing field" for labor unions in their struggles with management. "I do not view the labor movement as part of the problem. To me, it's part of the solution," he said. "You cannot have a strong middle class without a strong labor movement." Obama used the occasion at the White House to announce formally a new White House task force on the problems of middle-class Americans, and installed Vice President Joe Biden as its chairman. _Require federal contractors to offer jobs to current workers when contracts change. _Reverse a Bush administration order requiring federal contractors to post notice that workers can limit financial support of unions serving as their exclusive bargaining representatives. _Prevent federal contractors from being reimbursed for expenses meant to influence workers deciding whether to form a union and engage in collective bargaining. "We need to level the playing field for workers and the unions that represent their interests," Obama said during a signing ceremony in the East Room of the White House. Signing the executive orders was Obama's second overture to organized labor in as many days. On Thursday, he signed the first bill of his presidency, giving workers more time to sue for wage discrimination. "It's a new day for workers," said James Hoffa, president of the International Brotherhood of Teamsters, who attended the White House ceremony with other union leaders. "We finally have a White House that is dedicated to working with us to rebuild our middle class. Hope for the American Dream is being restored." Of the White House Task Force on Middle Class Working Families, Obama said, "We're not forgetting the poor because they, too, share our American dream." He said his administration wants to make sure low-income people "get a piece" of the American pie "if they're willing to work for it." The president and vice president said the task force includes Cabinet departments whose work has the most influence on the well-being of the country's middle class, including the departments of education, commerce, health and human services and labor. "With this we have a single, highly visible group with one single goal: to raise the living standards of the people who are the backbone of this country," Biden said. He pledged that the task force will conduct its business in the open, and announced a Web site, A Strong Middle Class, for the public to get information. He also announced that the panel's first meeting will be Feb. 27 in Philadelphia and will focus on environmental or "green jobs." Is Milwaukee developer buying opposition to local hiring and fair wages? Word out of City Hall is that Richard Lincoln, VP of the Mandel Group, a wealthy and politically connected Milwaukee development firm, has been making the rounds lobbying against the proposed MORE Ordinance that would require hiring and contracting standards for development projects that receive $1 million or more in city financial assistance. It’s not too hard to see why the Mandel Group is working so hard against community benefits (they have 5 lobbyists registered to work on it). Mandel has received millions of dollars in public aid for several projects, from Library Hill a decade ago to the North End project currently under construction, and they want to keep it that way. Of course they don't want to come out and admit how profitable it been to be drinking from the public trough. So they are circulating a short paper by Mark Eppli, chair of the Real Estate Department at Marquette University, in their effort to discredit prevailing wage standard requirement legislation. Eppli’s “paper” is a selective and superficial look at a handful of construction projects that doesn’t meet the rigor of an introductory economics course. The assertions that prevailing wage standards for construction workers contribute to unreasonably high project costs and exclude minority workers are not drawn from the data in the work that Eppli cites. Beyond the bad science, there is at least the appearance that Eppli’s “paper” is research for hire. Eppli runs Marquette’s ACRE program designed to attract more minorities into the real estate profession. The Mandel Group is the primary financial sponsor of the ACRE program. City leaders should be asking is this research for hire, with a foregone conclusion designed to satisfy a major funder? The major source of the data that Eppli uses in his paper is Cross Management Services. Cross Management is a firm that monitors Disadvantaged Business Enterprise contracting requirements on construction projects that is frequently retained by the Mandel Group. Cross Management has a direct financial interest in providing data that supports Mandel’s opposition to community standards legislation. You simply don’t bite the hand that feeds you. Common Council members should reject this “research” for the propaganda it is. Whether it is federal stimulus funding or City of Milwaukee TIF money, taxpayers and city leaders have a right to expect that taxpayer supported projects hire local residents, build real career pathways, pay prevailing wages and contribute to long-lasting economic development outcomes for workers and the entire community. For decades the city has subsidized private developments assuming that the benefits would trickle down to employees and Milwaukee's neighborhoods. Milwaukee's nationally high poverty rates (7th) and the alarming rate of African American male unemployment (46%) demonstrate the failure of this approach. Big developers have had their way with TIF for the past decades. It's time for them to accept hiring and wage standards as part of any taxpayer supported deal. Otherwise they’re free to forgo the public money. If Mandel Group really wants to aid minority workers in the City, then pay them the prevailing wage for construction employment! The standards contained in the MORE Ordinance are a step in this direction. Last week the Wisconsin Policy Research Institute (WPRI) released a study predicting that 143000 "chronically ill, uninsured, sporadically employed and otherwise unemployable"people would migrate to Wisconsin between 2009 and 2015 if Healthy Wisconsin is enacted. It also projects escalating costs. It concludes that while Healthy Wisconsin may be well intended it would turn "the state of Wisconsin into a health care 'magnate.'" This report will be used in the legislature by opponents of expanding healthcare coverage to the Wisconsin's 530,000 uninsured. The report may be an effective political instrument, but it is flawed social science. The WPRI's projections of Healthy Wisconsin motivated migration to the state rests on two questionable assumptions. First, the authors assume that the decision to relocate is a rational economic choice -that people relocate because a state or community has a more attractive package of public goods and services than their current location. Second, they assume that there will be expansion of healthcare coverage at the national or state level before 2015. The report ignores a body of research that has identified family ties as one of the prime factors in the decision to relocate. Yet, a cursory review of Milwaukee's historic immigration patterns indicates that large numbers of Milwaukee migrants came and come from places like Porticello, Sicily and Crystal City, Texas because they have family connections in Milwaukee. As Corbett noted in his paper on Wisconsin's welfare migration:"... people moved for a number of reasons; the relocation decision was not one-dimensional. Some reasons for relocating-proximity to family and friends, the desire for a better life, and the hope of finding a job-appeared significantly more important than the size of welfare payments." If the authors are correct that universal healthcare will lure 143,000 to Wisconsin, they need to explain why we haven't experienced a similar migration of U.S. citizens to Canada where health care is a public good accessible to all. Even if we assume that Canada's cold weather is a sufficient disincentive for those from states with more temperate climates, surely tens of thousands would have migrated from northern states such as Wisconsin, Minnesota, the Dakotas, Vermont, and Western New York. That migration simply has not occurred. Second, the report's projection assumes there will be no other progress in expanding healthcare coverage to the nation's uninsured and that Wisconsin would remain the only state with a universal healthcare program through 2015. Both are highly unlikely. Only yesterday the U.S Congress allocated $127 billion to provide healthcare coverage for nearly 8.5 million newly uninsured people, the very folks the WPRI fears will move to Wisconsin if Healthy Wisconsin is passed. Other states like Massachusettes, have already begun expanding health care coverage. If only one other state adopts a universal healthcare program, the WPRI projections would necessarily be cut in half and if 3 or 4 other states enacted similar legislation there would be further proportionate decreases. If Illinois or the Obama administration follows through on its commitment to provide access to healthcare for every American, the migration would disappear entirely. hroughout American history reforms has often are initiated at the state level. Unemployment compensation, worker's compensation, child labor laws and minimum wage increases were originally developed at the state and even local level. Fortunately, the proponents of these successful reforms were not paralyzed by the fear that raising standards and or expanding coverage locally would attract hordes of unproductive people. But that is the WPRI paradigm. There are other problems with the WPRI approach. They project increased costs associated with in-migration, but fail to factor in any savings associated with providing universal healthcare to the state's half a million uninsured despite the overwhelming evidence that caring for the uninsured is one of the factors now causing healthcare premiums to soar in the state. It is not surprising that the WPRI would sponsor a study that undermines efforts to make healthcare a public good. The WPRI is an ideologically driven organization that promotes studies that reinforce its commitment to laissez faire economics. But should we really withhold healthcare from 530,000 uninsured Wisconsin citizens because some ideologues imagine a healthcare invasion? Read his answer and entire column. Harley Davidson's layoffs are another indicator that the economy is in a freefall. That is why most economists support the Obama administration's push for a large stimulus package. Private demand (consumption and private investment) is non-existent. The only way to reverse the economy's decline is through increased public demand. President Obama has proposed an $825 billion stimulus package. Many economists think that Obama's proposal is too modest and that a stimulus in the range of $1.3 trillion is needed. But not the Republican Party! The very same Republican leaders who remained silent as President Bush ran record deficits nearly doubling the national debt are now expressing concern over Obama's plan. These are the very same politicians who refused to extend unemployment benefits, increase food stamp expenditures and expand health care for children from low-income families a little more than a year ago. The only economic recovery measures they support are tax cuts, one of the least effective forms of stimulus. The right's failure to recognize the severity of the crisis and to endorse an effective federal responses has contributed to the loss of 2.4 million jobs in the last year, more than a million in the last two months. Once again they are digging in their heels and opposing federal action. President Obama has exhibited restraint in responding to this ideologically motivated opposition. But people are hurting and the Republican Party is standing in the way of help. Nobel Prize winning economist Paul Krugman summarized the Republicans opposition in his New York Times Column, "Bad Faith Economics" today: "Basically conservatives are throwing up any objection they can think of against the Obama plan hoping something will stick." President Obama politely listened to Republican gripes about his stimulus package during a meeting with congressional leaders last Friday - but he also left no doubt about who's in charge of these negotiations. "I won," Obama noted matter-of-factly, according to sources familiar with the conversation. In an earlier interview President Obama was clear about his negotiating style. Right-wing ideologues who have led their party toward irrelevancy and the country to the brink of economic disaster ought to remember what the President had to say. Researchers have identified an "Obama effect" suggesting that President Barack Obama's accomplishments reduce African American test-takers anxieties and increase their sense of competence leading to improved test scores. The study has not been peer reviewed and it was based on a small sample. But it offers some preliminary hope that Obama's election may help reduce the racial achievement gap. The article on the study is linked. UWM professor, Marc Levine and I have a Milwaukee Journal Sentinel op ed, "Sick pay is smart economically," refuting the "Chicken Little" hysteria of opponents of Milwaukee's new paid sick leave ordinance. It is linked as well. Milwaukee School Board President Peter Blewett today condemned the use of “push polling” against him in his campaign for re-election to the Milwaukee School Board. Blewett explained that numerous supporters in his district have received “push poll” calls this week from the Parker Group of Birmingham , Alabama . These calls start off with straight-forward questions, and then ask voters “push questions,” stating that Blewett authorized Board Member Charlene Hardin to attend a personal trip with Board funds. Blewett stated for the record, “I did not authorize Director Charlene Hardin’s trip to Philadelphia .” As President, all Board member travel is supposed to come across his desk, but the Philadelphia trip was approved by the MPS administration without Blewett’s knowledge, he explained. “The entire trip is under investigation now, an investigation that I hope is completed very soon,” Blewett added. “If the investigation concludes that Director Hardin broke the public trust by using taxpayer money for personal reasons, as the media has reported, then the Board has already acted to censure her. If reports are true, I have also called for her to repay the funds to the district,” Blewett said. “These push polls are classic sleazy campaign tricks,” Blewett stated. “I have never used them. I want a campaign that focuses on how MPS can prepare our students for the challenging world of work or higher education. Voters have a right to hear about how candidates plan to improve MPS. Secretly-funded sleaze campaigns debase the democratic process and insult voters’ intelligence,” Blewett added. The Parker Group is a political and corporate telemarketing operation that is most notorious for engaging in “race-matched calling” where its African American employees are given one script to call black voters while its white employees call white voters with a different script, Blewett explained. In 1999, a federal court of appeals found the Parker Group guilty of racial discrimination in employment against an African-American employee because she was only permitted to telephone black voters. Last week Heinemann's abruptly closed its last three restaurants due to declining sales, increased competition and the deepening recession. With no advanced warning 115 people lost their jobs. Co-owner Peggy Burns also blamed Milwaukee's new paid sick day ordinance. Milwaukee's new ordinance doesn't go into effect until February 10, 2009. And two of the three shuttered stores and their employees would not have been covered by the law since they were located outside the city in Fox Point and Brookfield. Earlier, the company closed stores in Greendale, Whitefish Bay, Grafton and Wauwatosa. None of these stores were effected by the sick pay ordinance either. Apparently opponents of providing employees with paid time off when they or a family member are ill are so angry about the law that they feel justified in lying about its impact. Next we'll be told that Milwaukee's high poverty and black unemployment rates are caused by the sick leave ordinance. Or that Tower Automotive shut down because of the onerous regulation. As layoffs and business closings increase in the coming months, we will continue to hear opponents of paid sick days blame it for all of Milwaukee's economic woes. Don't believe the hype. Milwaukee County Executive Scott Walker's decision to reject federal economic stimulus dollars reflects a zealous commitment to the very market extremist ideology and Republican orthodoxy that has helped create the current economic crisis. As several commentators ranging from Gretchen Schuld, Bill Christofferson, and Rob Henken to the Milwaukee Journal Sentinel editorial board have noted Walker's position sticks it to Milwaukee County which has significant infrastructure investment needs including: $10 to $15 million for the Milwaukee Public Museum; $5.5 to $8.5 million for the Milwaukee County Zoo (plus another $130 million for capital improvements); $276.6 million for the Milwaukee County Parks; and $56 million for 150 new buses and $15 million annually to operate the collapsing county transit system. And what about the community's growing number of unemployed workers. Milwaukee has lost 6,000 jobs this year. Black male unemployment is the second highest in the nation. The city's official unemployment rate stands at 7.7%. The real rate including those who have dropped out of the labor market and those working involuntarily part-time is almost 13%. We have the 7th highest poverty rate in the nation. Yet, Walker intends to turn down proposed federal investments in the community that will help repair the failing infrastructure and create jobs. The investments that Walker opposes are effective job creators, much more effective than the tax cuts than Walker says he would consider supporting. I have attached a chart based on data complied by Mark Zandi, a former economic advisor to Senator John McCain, that show that tax cuts are an ineffective form of stimulus compared to alternatives such as extending unemployment benefits, increasing food stamp allocations or investing in the infrastructure. We've been down the Walker tax cut road before and it leads to nowhere. A year ago, as layoffs increased and output declined, it was clear that monetary policy, the manipulation of the money supply to promote economic growth with price and employment stability, was not enough to end the recession. Unfortunately, President Bush and congressional Republicans refused to consider any form of economic stimulus except tax cuts. They even refused to support an extension of unemployment benefits for workers who had exhausted their 26 weeks of unemployment compensation despite the rapid increase in the ranks of the long-term unemployed. They stubbornly refused to support any increases in federal spending because it did not fit their narrow ideology. 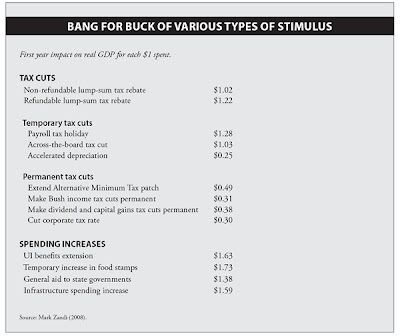 Zandi chart indicates are among the least effective form of stimulus. Economists have labeled this the paradox of thrift and it was first identified by John Maynard Keynes, the noted English economist. Established economic theory assumes that the pursuit of self interest will be good for the entire economy. But when the economy is doing poorly, people save for a rainy day. While this may be personally rational, it is irrational for the economy as a whole which needs increased aggregate spending to grow. The economy has lost 2.6 million jobs in the last year and more than a million in the last two months. Milwaukeans are hurting and the County is falling apart. County Executive Walker's stubborn refusal to recognize these dire circumstances and the need for immediate action has nothing to do with principles. It is the type of reckless zealotry that sacrifices the lives and well being of millions on the altar of a failed ideology. In November Milwaukee voters overwhelmingly passed an ordinance that guarantees workers the right to earn paid sick days. Milwaukee joined San Francisco and Washington DC as the third city to require these benefits. The referendum passed by a margin of almost 70% to 30%. Despite the overwhelming margin of victory, the Milwaukee Metropolitan Chamber of Commerce (MMAC) has aggressively opposed the measure. Two weeks ago the organization filed a lawsuit against the city seeking to strike down the law. The MMAC is also asking for a temporary injunction to block the city from enforcing the legislation that is scheduled to go into effect on February 10, 2009. The MMAC's opposition, while short-sighted, is not unexpected. Business organizations have consistently opposed social legislation like laws outlawing child labor and discrimination or regulating business behavior like the Clean Air Act. For the past three decades they have aggressively opposed any effort to raise the minimum wage even as its real real value has fallen to historic lows. Their consistent opposition makes some sense since such legislature imposes costs or at least prevents businesses from externalizing their costs, thus reducing rates of profit. The long-term benefits of increased employee loyalty and productivity and reduced hiring and retraining costs are seldom acknowledged. But Tim Sheehy and other MMAC spokesman have stooped to new a new low in their desperate attempt to discredit Milwaukee's new ordinance. The MMAC's Steve Bass, a former Republican assembly operative , labeled the new law "a sort of terrorism." It is perverse to equate providing employees with time off when they or a child is ill with suicide bombings. The former provides workers with a humane benefit so that they no longer need to choose between their job and caring for their family, while the latter uses murder to terrorize the general population. Additionally, Bass's rhetoric belittles the lives and sacrifice of the victims of terrorist attacks and those who have died trying to bring the perpetrators of political violence to justice. Not to be outdone, the MMAC's President Tim Sheehy claims the ordinance is affecting job growth in Milwaukee and predicts "dire economic consequences." But Milwaukee's labor market had collapsed and the city's workers were experiencing what the UWM Center for Economic Development has characterized as "a stealth depression" long before this ordinance was passed. Exactly what job growth is Mr. Sheehy claiming the City has lost? The country is experiencing the worst recession since the Great Depression. We lost half a million jobs last month and 2 million in the last year. Business investment has collapsed, a victim of the housing bubble's collapse and the resulting financial sector's meltdown. Last year, Wisconsin lost 32,4000 jobs. The Department of Revenue is projecting that Wisconsin will lose another 37,700 manufacturing jobs (7.7% of the state's total) and 121,000 construction jobs( 5% of all construction jobs) next year. Milwaukee is hemorrhaging jobs. Two thousand two-hundred and sixty-six (2,266) more Milwaukeans were unemployed in September 2008 than a year ago, long before the sick day ordinance was passed. Milwaukee ranks a dismal 34th among 50 cities in the annual rate of employment growth, has the 2nd worst rate of black male unemployment and the worst black-white unemployment ratio in the nation. The simple fact is that long before the sick day referendum passed, business investment in new plant and equipment had collapsed and companies were laying off workers at an alarming rate. In addition, many of the firms like Crazy Water, Outpost Natural Foods, and Lackey and Joys, whose spokesmen have opposed the ordinance, won't abandon their Milwaukee location in response to a marginal cost increase because they require access to the city's market. As realtors always tell us: "location, location, location!" Mr. Sheehy's concern over Milwaukee job loss is also hard to take seriously since the MMAC has consistently promoted policies that have destroy local jobs and drive down wages. The MMAC was a vocal proponent of NAFTA and other free trade agreements that have contributed to a reduction of employment in high-wage traded-goods industries, growing wage inequality, and a steady decline in demand for workers without a college education. NAFTA alone cost Wisconsin 25,403 (-0.9%) jobs between 1994 and 2006. The MMAC has also aggressively promoted trade with China. The organization's China Business Council has even sponsored tours of China. Yet, between 2001 and 2006 Wisconsin lost 38,000 jobs because of the growing trade deficit with China. And Mr. Sheehy actively opposed the County's advisory sales tax referendum aimed at providing a dedicated source of revenue to the County's beleaguered transit system. Sheehy actually authored a letter to Milwaukee's County Board members urging them to uphold County Executive Walker's veto of the referendum. Mr. Sheehy surely knows that one of the major impediments to economic development in Southeastern Wisconsin is the spacial mismatch between large numbers of unemployed workers, disproportionately African-American, living in Milwaukee's central city, and employers located in suburban and ex-urban locations who have had difficulty finding qualified workers. Key to addressing this problem is a mass transit system that links people to jobs. Yet Sheehy and the MMAC opposed the County's advisory referendum designed to address this mismatch. Republican partisan politics trumped investing in the regional economy. The economic consequences of the MCTS's deterioration is nothing short of "dire." The "stealth depression" in the city of Milwaukee's labor market calls for bold, new departures in public policy. Yet the MMAC has opposed initiatives in public investment, regional cooperation, reducing metro-wide racial segregation, industrial policy, and community benefits agreements that should be part of an aggressive anti-unemployment strategy in the city. The MMAC's use of scare tactics to oppose the sick pay legislation is consistent with this dismal record. Rather than waste the city's scarce tax dollars in a lengthy court case, the MMAC and the firms it represents should obey the law. They might just discover that when businesses treat their workers humanely, their employees will be more loyal and productive and replacement and training costs will decline. Our former colleague, friend and the inspirational President of AFT Local 212, Ernie Schnook, died Wednesday in the home he grew up in, surrounded by his wife and family. Ernie graduated from MATC in Foundry Science, worked in private industry, then came back to the college that changed his life to teach Foundry Science. While working full time as an MATC instructor, Ernie earned both M.A. and B.A. degrees with honors. When the local industry declined due to jobs being exported to lower-wage countries, Ernie transferred into the Liberal Arts Division where he taught Social Science. His life’s work was the thousands of students whom he inspired. Ernie always said that there was nothing more important than MATC’s students. Whether teaching with foundry grit under his fingernails or about American institutions, Ernie taught skills that lasted a lifetime with strong doses of philosophy and pride. “Nothing is too good for the working class,” was his mantra. And he practiced what he preached, dragging foundry students out of bed to make sure they attended his classes. The poorer and more disadvantaged the student, the harder Ernie worked to help him succeed. Ernie Schnook had as much influence as anyone over the past twenty five years in shaping the Milwaukee Area Technical College (MATC). MATC employees’ and retirees’ careers and quality of life are the fruits of Ernie’s tireless advocacy. He was an unstinting champion of technical education, and fought ferociously any attempts to downplay technical instruction or transform MATC into merely a junior college. Under his leadership Local 212 won and protected contract language that ensures manageable class sizes, guarantees faculty and staff a voice in the affairs of the college and provides part-time faculty the best adjunct contract in the state. Ernie believed passionately in empowering MATC employees who worked directly with students because they, and only they, knew what was best for our students and the institution. He hated “the carpet bagging careerists and sycophants” who used MATC but never valued it. Nobody who ever met Ernie could forget him. He was a bull of a man with a heart as big as the downtown campus. He was tenacious, whether encouraging and cajoling his students, convincing an MATC Board member on an issue, fighting the administration or insisting that a 212 member come to a meeting or a picket line. Former MATC President John Birkholz once said of Ernie, “When he gets on an issue, he’s like a bulldog with his teeth in your calf – he just doesn’t let go.” Ask anybody who served on the Executive Board under Ernie, and they’ll tell you it was impossible to say “no” to him. In addition to being an activist, Ernie was also a public intellectual in the best sense of the word. Behind his ever-present vest and his foundry man’s gruff exterior, he was incredibly well-read in the classics and contemporary affairs, a passion he always credited to his Communications Skills Instructor and former Local 212 President, Maxine Lubenow. He created hundreds of wooden plaques that adorn Local 212’s office walls: plaques quoting philosophers and activists who inspired him, cartoons lampooning bosses, corrupt politicians, the rich and powerful, and the MATC administrators who used the college for their own promotion rather than the students’. Even though he spent his last ten years at MATC teaching Liberal Arts, Ernie’s heart never left the foundry. While he valued craftsmanship and was skilled with his hands, he passionately believed in higher education. He hated the class system that condemns working people to a life of labor while reserving the life of the mind for the elites, and his life was the embodiment of rebellion against that system. Despite being more ill than any of us knew, and despite deep skepticism towards both political parties, Ernie worked tirelessly in the Local 212 office to help change the direction of the country and elect Barack Obama President of the United States. 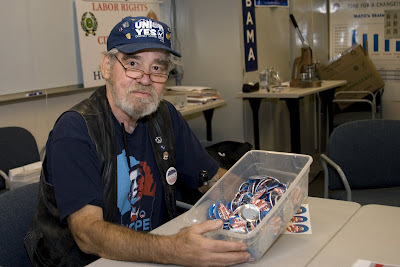 Ernie made thousands of Obama buttons. Some made their way to EBay even though Ernie, an admitted Luddite, never learned to use a computer. Ernie was a man of the world. Born in Germany, he served in the U.S. Army in France where he met his wife and life partner, Josiane, an MATC Early Childhood educator. He was an internationalist who believed he had more in common with working men and women in Iraq, Rio or Paris than he did with any boss. Long before the war in Iraq became highly unpopular, Ernie organized a weekly picket line against it, and he continued to walk that line every Sunday until his health prevented it. At 4:30 on the last day of 2008 this larger-than-life man’s big heart stopped beating. Through his life and work Ernie set a standard that all of us can learn from and try to live by. A celebration of Ernie’s life and work will be held at the Milwaukee Area Technical College on January 14, from 4:00 – 6:00 PM, with the program beginning at 5:00 PM. The exact location will be announced as soon as arrangements are final. In lieu of flowers, please contribute to the Ernie Schnook Scholarship Fund at the MATC Foundation, 700 West State Street, Milwaukee, WI 53233.